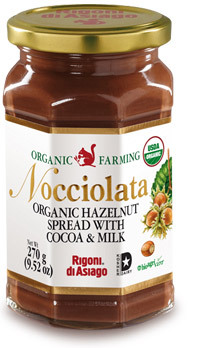 Okay, so I know almost everyone likes “chocolate” hazelnut butter…. & if you don’t, well…I’m not sure what to say actually because I have never encountered anyone who hasn’t. While I’ve had plenty of the typical brands on the shelves, I have yet to see this brand, Rigoni di Asiago. Now that’s probably from one of a few things. 1. I am in the ZONE when I shop. I need xyz brand and I don’t look at other brands. 2. I am oblivious sometimes or 3. perhaps the store actually doesn’t have it. However, there is a little specialty store by my house that I have a feeling will definitely carry this product, and I 100% want to buy it after trying it. This product is a product of Italy, gluten free, made without palm oil, non-GMO, organic, and does NOT contain hydrogenated fats (yay! ), or artificial colors, flavors or other additives. 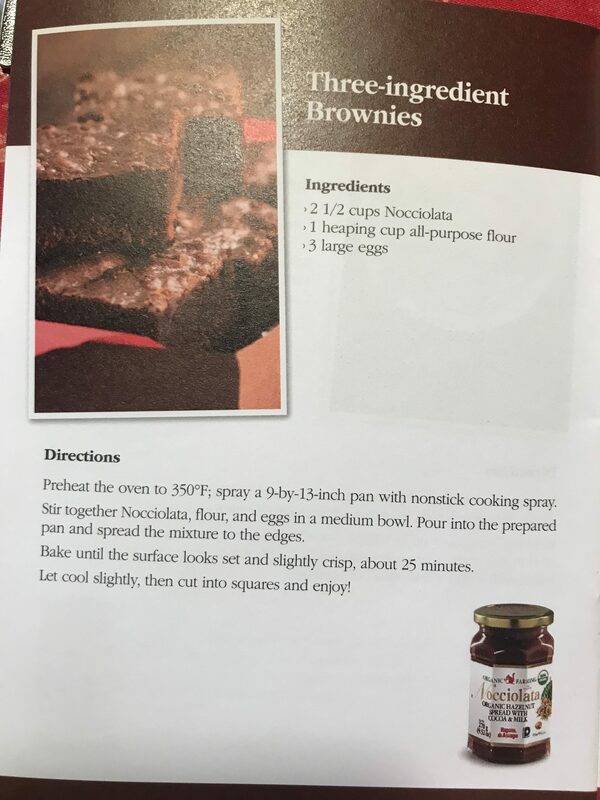 According to the pamphlet I got, the hazelnuts are selected by the Rigoni family…which I think is both amazing quality assurance and…well…adorable. Now this is not a health food by any means, BUT, it is a much better alternative to a more processed version of hazelnut spread, because we all need our sweet fix every now and then. note…the jar is empty…oops. Perhaps I *inhaled* this jar? + my family found this jar and decided they were going to inhale it as well. Le sigh. Anyway, this is well worth the “cheat”. Smooth, creamy and sweet. It is definitely on the sweeter side, but in a way that is a good thing, because it’s hard to eat a lot of something when it is su indulgent. The jar is pretty small… so make it last! 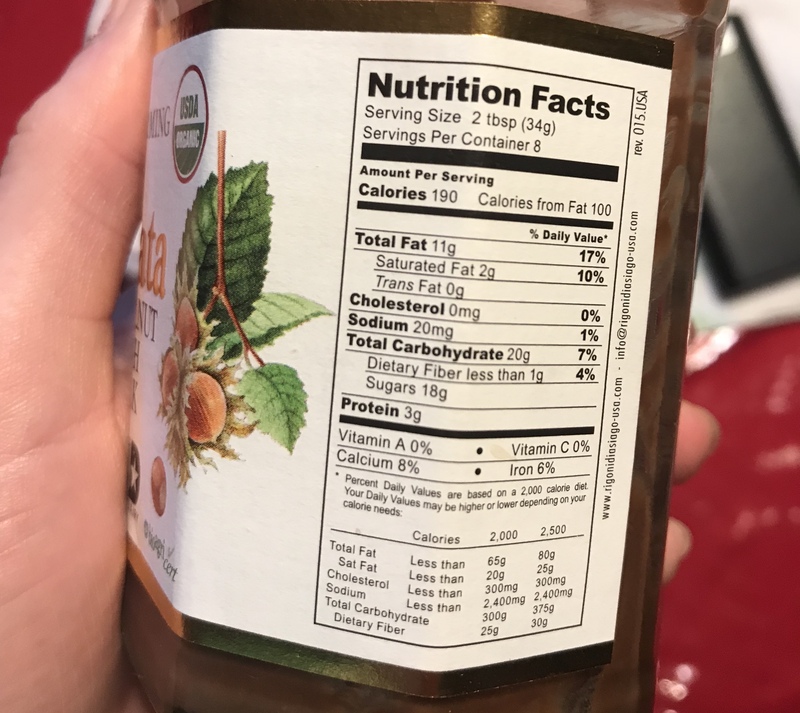 The saturated fat isn’t terrible, I’ve seen much worse in other hazelnut spreads which I am contributing to the fact they didn’t use palm oil. Which I also like- because it didn’t have that “oily residue” on top that I’ve seen before. DISCLAIMER: This is an unbiased review. I received this product for free.